MOBILE, Ala. (August 23, 2018) - The Mobile BayBears and Los Angeles Angels have signed a four-year Player Development Contract (PDC), which will continue the affiliation between the two clubs through the 2022 season. The contract will remain in effect when the BayBears move to Madison, Ala., following the 2019 season. 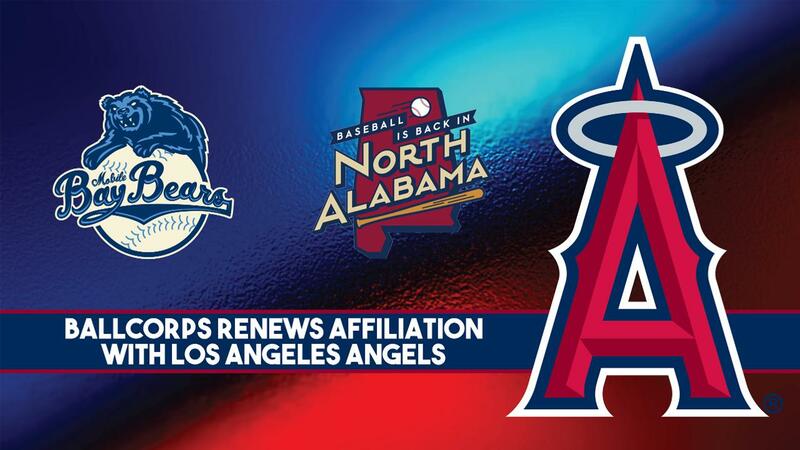 "We look forward to continuing our affiliation with the Los Angeles Angels over the next four years, with the final season at Hank Aaron Stadium in Mobile and our future home in North Alabama," said Ralph Nelson, the Managing Partner & CEO of BallCorps. "The Angels ownership, front office, coaches, medical staff, and players are all quality individuals who have made this partnership successful over the past two years. We have seen continued success from the Angels organization, which will bring a high quality of baseball to North Alabama beginning in 2020." In an 18-month span, the Angels farm system has improved from No. 30 to No. 10 in all of baseball, jumping 20 spots in Baseball America's team-by-team rankings. 19-year-old outfielder Jo Adell , the top prospect in the organization and No. 10 overall selection in the 2017 MLB Draft, was recently promoted to Mobile and represented the Angels in this year's SiriusXM All-Star Futures Game. Over the past two seasons in Mobile, 11 former BayBears have appeared with the Angels. Additionally, four members of the 2018 team spent time with the Major League club this year. Six of the Angels Top 10 prospects, according to MLB Pipeline, were members of the BayBears in 2018. This season, Mobile finished with the best first-half record by an Angels Double-A affiliate since the 2011 Arkansas Travelers, led by future Major League All-Star Mike Trout . The team will relocate to Madison, Ala., following the 2019 season and begin play in North Alabama in 2020. After receiving thousands of votes in the "Name The Team" sweepstakes, the list has been narrowed down to the top five names. Voting will continue through Labor Day, September 3. For more information, visit NorthAlabamaBaseball.com.